Tiffany Capers’ day job is at Teach for America. 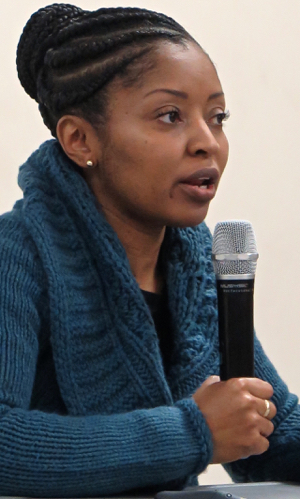 In the video below of her presentation, Capers looks off to her right, where participants could see a series of PowerPoint slides. She declined to make the slides available for posting on this page. The Forum began with prayer and then an introduction to Dr. Clayton Wilcox, the incoming superintendent of Charlotte-Mecklenburg Schools. Capers’ preesentation begins at minute 18:15, and is followed at minute 43:30 by a Q&A. The Post Foundation’s current website appears to be here. A site devoted to the Black LIves Matter Charlotte initiative is here.